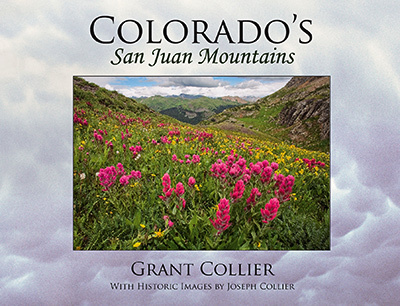 ﻿ Colorado's San Juan Mountains, photography book. The San Juan Mountains in southwestern Colorado are among the most spectacular mountains in the world. They contain seven wilderness areas, nine distinct ecosystems, and more land above 10,000 feet than any other mountain range in North America. In Colorado’s San Juan Mountains, renowned photographer Grant Collier has captured the sublime beauty of these mountains. Grant has explored every stretch of the San Juans, photographing jagged peaks rising to dizzying heights, undulating meadows covered with wildflowers, and immense waterfalls plunging over rocky cliff faces. This book also leads you back in time with a selection of photographs from the 1880s taken by Grant's great-great-grandfather, the pioneer photographer Joseph Collier. 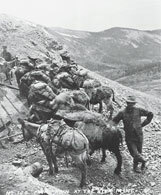 The combination of historic and modern photographs provides a compelling new perspective on Colorado’s most expansive mountain range.